At least twice a year the biggest watch nerds (such as myself) get together in Switzerland, first in Geneva, then in Basel to talk watches, go out and check out latest novelties from the biggest brands in the industry. However we are not alone – other industries too have their fans and enthusiasts, and twice a year fashion lovers all meet in Florence, Italy to celebrate men’s style and fashion at ‘Fortezza da Basso’. Pitti Uomo is by far the biggest ‘fashion fair’ for men today, and this year we’ve decided to hit Florence and check it out for ourselves. As we got a lot of material I would spread this article in two parts, with this one being about the selected few influencers, or super stylish men in general, gathering for a dinner organised and hosted by us together with our friend Samuel Naldi, owner of Edelberg, a brand that produces exceptional writing instruments and awesome fashion accessories. If you are a fan of mens fashion most of these people at the table would probably look very familiar to you, but in case you aren’t let me introduce you to some of the most dapper gentlemen in Italy (and world, of course). Nicola and Valentino Ricci, owners and creators of ‘Sciamat’ – a fashion blog and handmade clothes manufacturer, were rocking their jackets that seemed to perfectly reflect their personalities and style. Just like everyone else gathered in that restaurant that night, they were the trendsetters, the individuals rather than the crowd, following some brand’s image of a stylish man. Andrea Luparelli is yet another great example of that – owner of ‘Sartoria Ripense’, a tailoring house in Rome, definitely knows a thing or two about bespoke clothes, and was a great guest to have that evening. 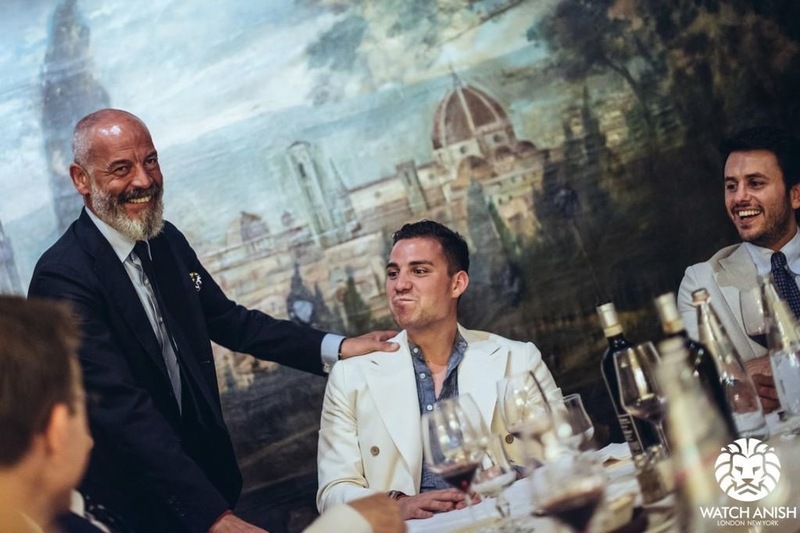 As an admirer of beards (and that guy, trying to grow one) I was very happy that Antonio Rossi and Gianni Fontana both made it to the dinner after killing it at the fair during the day. Of course it was great having our friend Fabio Attanasio, creator of the awesome blog ‘TheBespokeDudes’, as well as Giancarlo Maresca – grand master of a Chivalric order, Dott. Vincenzo Gonnella, vice president of BSI, Nish De Gruiter – global partner of Suit Supply and Lino Ieluzzi, a man whose name (and patek) speaks for himself – a true style icon and legend, who gave colourful clothes and double breasted suits the fame they enjoy today.